Dr. Rock's Blog & Roll: Album of the Day: Cat Stevens (11/23/70) 39 Years! Album of the Day: Cat Stevens (11/23/70) 39 Years! Cat Stevens had several singles and three mediocre albums during his attempt to launch his career as a folk-rock singer/songwriter in the late 60s. While he garnered some attention in his native England, he found virtually no audience in the U.S. and, out of frustration, considered ending his efforts. But he had a backlog of decent material, and so decided to give it one more shot. His fourth album, Tea For Tillerman, rang the bell upon its release on November 23, 1970, reaching #8 in the U.S., #11 in Canada, #20 in the U.K. and, eventually #206 on Rolling Stone Magazine’s Top 500 albums. Tea For Tillerman's push up the charts benefited from the big single “Wild World,” which was issued in advance of the album and created the buzz Stevens needed to break into the U.S. market. But the album carried its own weight beyond the single. Four songs in particular, “Father And Son,” “Longer Boats,” “Where Do The Children Play?” and “Hard Headed Woman” have become timeless favorites for Cat’s devotees and casual fans alike. 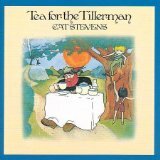 Tea For Tillerman was the first of five straight U.S. Top 10 albums for Stevens. It’s available as a CD from Amazon (click here) and as downloadable tracks from iTunes (click here).